This guest post by Erica Seidel is part of a regular column she writes, Ask the Martech Recruiter. Erica runs The Connective Good, a retained executive recruiting firm that helps companies land leaders in martech, marketing, digital strategy, analytics, and market research. I am interviewing for a martech job this week and I really want it! But the competition is stiff. How can I make myself more memorable in the interview? Great question! In order to get the job, you first have to stick in the interviewers’ heads. And not everyone can do that. I’ve interviewed thousands of people. And a small handful of those people have stuck in my mind way more than others. They can very clearly spell out how they are distinct, and why that matters. 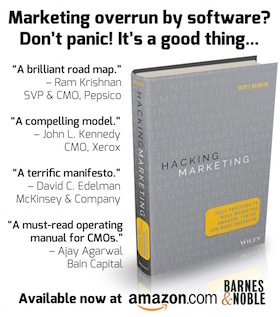 You may have to bend over backwards to put your work into context, especially for people who are not martech experts. They share a bit about themselves personally. There was the candidate who said, “I grew up on a farm and it was a big optimization challenge every season, to figure out how to most efficiently harvest the wheat and the soybeans and the corn.” That search was for a company that had a hard-working culture and needed someone to optimize and scale its operations. That candidate got the job. Then there was the candidate — someone I recently placed in a VP role — who mentioned this in passing: “If I was in a band, I wouldn’t be the lead singer. I’d probably be the bassist. I don’t always need to have the spotlight on me or get all the credit.” Well, hot diggity, I was looking for someone to join a low-ego culture and build marketing from the ground up, which can be messy. He got the job. At the best, knowing more about who a candidate is personally can help me make a better match. At the least, it’s a relationship accelerant — we’re building a foundation for deeper conversations later on. Map out a timeline of your life. We’re not just talking about your career here. wW’re talking about your life. What were the peak experiences? What has made you into you? Try peppering a couple of personal details into your conversations. There’s no need to share stuff that’s too personal. But a bit of vulnerability will make people like you, feel like they know you, and want to respond in kind. You may find it useful to try out your “personalization” approach with your friends. They punch up their language with vivid language and analogies. Which of the following two statements makes you sit up and pay more attention? Pay attention to the vivid language and metaphors that others use. Steal shamelessly! They bring a portfolio of work to share. We all take in information differently. Some of us need to see things. Some need to hear them. Some need to physically interact with things. A typical phone interview is slanted in favor of people who take in information through hearing. With a portfolio, you can engage more of the senses, while grounding the conversation in specifics of your work. Note that this can backfire if the person goes on and an about something that is not relevant to the job, or if the bulk of the work in the portfolio is not on point for the job we are discussing. Show some recent work samples. See also: interviewing for a martech role when the interviewer doesn’t understand martech. By invoking others like this, they become more believable with data, and they show they can share the spotlight. Increase your legitimacy by bringing in data points from others — even before you’re asked to provide references. They end up selling me on the job or the company that I am pitching to them. They are showing that they listen well, can quickly understand the business and the value it provides, and are excited about the opportunity. They often have a fresh spin on the pitch. If you’re excited about the job, show it, and say why. They anticipate the objections the hiring team will have. This often leads to the most candid part of the conversation. And it’s an opportunity for them to clarify or revise initial impressions. Ask confidently about how well you match the spec, and whether there are any concerns. They know what they want and where they can add value, and it shows. They don’t beat about the bush. Clarify your positioning before the interview. This is not the time to treat the recruiter or the hiring manager as a therapist. They avoid the sin of droning on and on. Call your voicemail and practice answering an interview question. Then play it back. If it is too long, trim it. Look for opportunities to interrupt yourself with questions that generate a conversation with your interviewer. If it sounds boring, work on inflecting your voice. What other tips for being memorable do you have to share? Please comment below. Have a question on recruiting or career transitions to propose for this column? Please email erica@theconnectivegood.com. Don’t worry, we’ll keep your name and company confidential. Readers: Erica is on the board of advisors of the MarTech conference. She will be leading an executive session at our upcoming event San Francisco, May 9-11, with a panel of CMOs: How Chief Marketers From Visa, Belkin, and Oracle Are Transforming Their Teams and Talent. Register today for the lowest “alpha” rate on tickets to guarantee your seat.